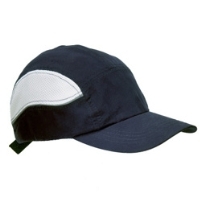 Another great microfiber performance cap. We call this one the "moon" style. It has nylon mesh panels with reflective trim. It is also mesh lined & comes with an adjustable nylon strap. As shown only. Custom colors: 576 pc. minimum.